Several years ago, my husband and I were in dire financial straits. We all know hindsight is 20/20, but at the time my decision to quit my full-time job to freelance exclusively felt right. (Okay, maybe it didn’t feel like the best choice, but I was optimistic.) The trouble was that even when I was bombarded with projects I had to wait anywhere from 30 to 60 days for a paycheck, and bills come around much more frequently than that. Long story short, we were broke. As bummed as I was to give up on my dream to work from home, proofreading in my pajamas with my dog cuddled up beside me, I started to look for another job–a job that would require me to shower and get dressed (oh boy). After a couple interviews, I felt confident I’d be offered at least one position, and we could start to turn our lives back around. Well, that’s just silly. I’m not beating up on my husband here; we were in a pretty desperate financial situation. But it doesn’t make sense, does it? The idea that we were already so far under water that there was no point in trying to reach the surface. Of course it mattered that I got a steady job. At that moment, though, if the money didn’t arrive, like, yesterday, we figured it may as well not bother showing up at all. Compare that response to my husband’s response to my potential new job. Did it make logical sense for us to just continue as we were, to fall deeper and deeper into debt? Or did it make more sense for me to get the job and for us to slowly but surely start working our way up, even if it meant we’d still have some bad days? I did get one of the jobs I’d interviewed for, and at first I couldn’t afford to eat much of a lunch away from home. My brother had jokingly given me a carton of granola bars for Christmas because he knew how much I loved them, and I kid you not, I ate one for breakfast, lunch, and afternoon snack for several days, waiting until I got home to eat something more substantial that we could prepare on the stove or in the oven. On those days I didn’t exactly feel like my new steady position was paying off–but it was. You’re going to have bad days as you work your way through your obsessions and compulsions. You’ll have days when you think the effort isn’t worth it, because you’re not to a point where an intrusive thought pops in and you’re able to react to it calmly, or you still perform rituals. And that’s okay! There is no magic formula for becoming the boss of OCD, and there’s no one-size-fits-all time frame for getting there. If you look at it as an all-or-nothing process, you’re bound to be disappointed. Go into it with an open mind, and with the realization that life isn’t always fair and everyone–everyone–has bad days, low moments, and feelings of doubt and despair, as well as high points and hopeful moments. If you wake up today and feel rotten, don’t give up. Engaging in a ritual is no reason to throw in the towel and completely give in to OCD. Overreacting to an intrusive thought doesn’t mean you’re doomed. Pick yourself up and dust yourself off and move on. Once I got that job, it took me several weeks before we could start really conquering our bills, and after several months I treated myself to a haircut. Giving up and going back to square one would have just meant more stress and financial uncertainty. 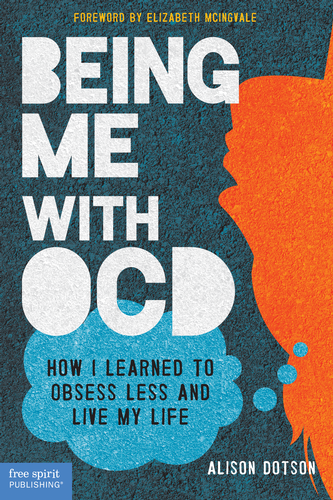 You deserve so much more than what OCD tries to allow you. You deserve a fuller life, but you have to put the work in first. Work on ditching black-and-white thinking. One realization I had relatively soon after my diagnosis with OCD was that I had to set manageable goals. I would never conquer my obsessions if I told myself I could never, ever have an ugly intrusive thought again. Instead, I had to arm myself with coping skills and tools to respond to those intrusive thoughts calmly. What can you tackle today?